What is all this talk about enrichment? Enrichment is defined as improving or enhancing the quality of something. So, enrichment in our dogs' lives is about enhancing their quality of life, giving them interesting things to experience and do, and in the process, we enrich our own lives too. Providing enrichment for our dogs is fun and lets us use our creativity. When we add these interesting things to our dogs' lives, however, there are other, extra benefits that may appear. Every dog can enjoy and benefit from enrichment, no matter what senses they rely on or what their physical abilities are. Sometimes when our dogs have physical or sensory limitations, they tend to slow down their activity levels or the things they try to do on their own. And we accept this as due to those limitations, but often it's because the way they experience the world has changed. A dog that can move easily and freely and that can experience its world fully with all senses, gets drawn to different objects, movement, and activities in its environment. If this changes and the dog doesn't see, hear and experience things in the same way, it may stop interacting with its environment. 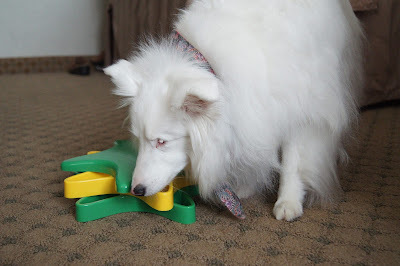 Adding enrichment to a dog's day-to-day life can help to keep it interested, happy, and content. It provides a sense of well-being. Enrichment offers the power of choice. We can empower our dogs to make choices about what they do during the day, so they aren't just sitting around waiting for something to happen. Enrichment builds a dog's confidence with new experiences. Keeping a dog used to change is important, because our lives with dogs don't tend to always stay the same. By continuing to introduce change into a dog's lifestyle, that dog will be better able to adapt to any changes that come its way. Providing new experiences in your dog's life will help to enhance its mental sharpness and problem solving ability. Enrichment keeps dogs busy and gives them a job to do. Many breeds of dogs were originally bred to have a job to do every day. Sitting around the house is a poor substitute for a job, and this is where many dogs find their own "job" - one which people don't always approve of! Enrichment can help a dog to learn to enjoy quiet time alone and can reduce separation issues. It can provide activities for dogs that are recovering from surgeries or injuries and may need to have crate rest time. Providing new experiences can reduce stress and boredom, and hence, can reduce stress and boredom-related behaviors that people often don't appreciate. Whatever your reason for wanting to provide enrichment activities for your dog, I know you will find it FUN! Fun for you ... and for your dog! If you'd like to learn more about providing enrichment for your dog, check out the new online class at Uniquely Paws-Able. Every week you will learn new fun activities to do with your dog, as well as about the many enrichment toys you can buy - and many more you can make yourself with things you already have around your house! You will learn some of the science behind why enrichment is necessary in a dog's life, and how to use enrichment activities to ward off behavior issues. Class starts next week! Hope to see you there!